Awesome Jen Price at Sycamore Consulting has shared some documents from the second of three LCI Core Team Meeting. The core team consists "of stakeholders with knowledge and expertise" who can help guide the study "through the identification of issues and opportunities, development of plan goals and objectives, and review ... the feasibility and effectiveness of recommendations." The meeting primarily summarized the feedback that was gathered during the Medline community meeting last week. A key item was to mark our calendars for March 29 for the public meeting / charrette, where the study group consultants will unveil some of their proposals to see what the community thinks. The location will be announced soon. Until then, Jen wanted everyone to know that links to slides from the two core meetings so far can be found at https://sites.google.com/site/medlinelcistudy/core-team while materials from community meetings are housed at https://sites.google.com/site/medlinelcistudy/community-workshops. As additional meetings take place, you can go to those links directly for updates. Under the core meetings section, you will also find a presentation titled "Health in the City" that discusses the history of the national health care infrastructure that led to building complexes such as the DeKalb Medical Center, Piedmont Hospital, etc. The presentation helped put in context how the DeKalb Medical site came to be (it was a 40-acre berry patch until 1960-ish) and where it and others hospitals like it may be headed as modern health care switches to a wellness emphasis and telemedicine, outpatient services, retail providers and smaller (acute, urgent care) models challenge the traditional hospital concept. The Medline study is in part named to reference the medical center's influence in the area; whatever changes may come, DeKalb Medical can be expected to remain an important player in the area's form and function. At the March 6 meeting, Mike Sizemore (from the Sizemore group who leads the study) mentioned a walkability study conducted in Kennesaw, GA that has good examples [pages 49 – 56] of the complete street concept ("complete" means that the street is designed to serve not only cars but also pedestrians and cyclists). The presentation, titled "AARP Active Living Workshop", is now available via the Medline website at https://sites.google.com/site/medlinelcistudy/resources [note: it's a large file, it may take a minute to load]. This report is worth reviewing: it has a lot of images that can give us ideas for how to fix some of our vexing, unfriendly roads. 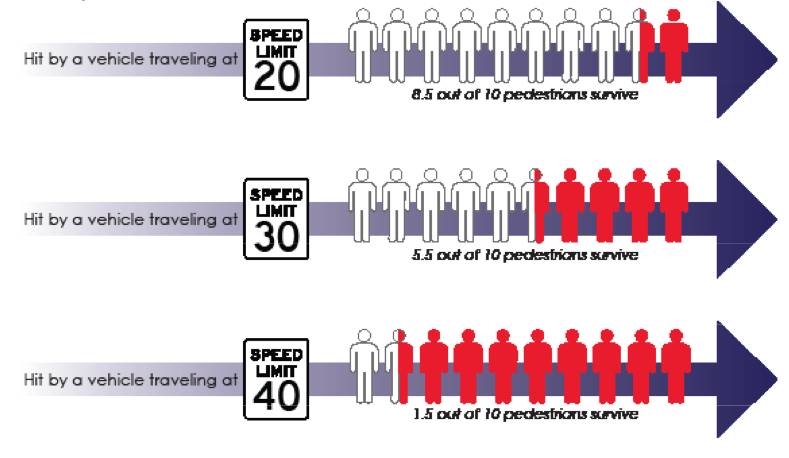 pedestrians for every10 who are hit by cars traveling at noted speeds. • A 5 to 10 mph reduction in traffic speeds increased adjacent residential property values by roughly 20 percent. Reduced traffic volumes on residential streets increases home values by an average of 18 percent. • A 10-point increase in Walk Score increases commercial property values by 5 percent to 8 percent. ... a one point increase in a neighborhood’s WalkScore (www.walkscore.com) increased home values as much as $3,000. • Cycling and walking investments return up to $11.80 for every $1 invested. Those who were closely following the North Decatur Road Safety Audit will find much to like in this report, so check it out! Lastly, the study group has generated a lot of maps describing the different attributes of the Medline site. Those maps can be found at https://sites.google.com/site/medlinelcistudy/community-workshops. Maps begin on page 17 of the first community workshop presentation.